A founder member of S.W.A.N. 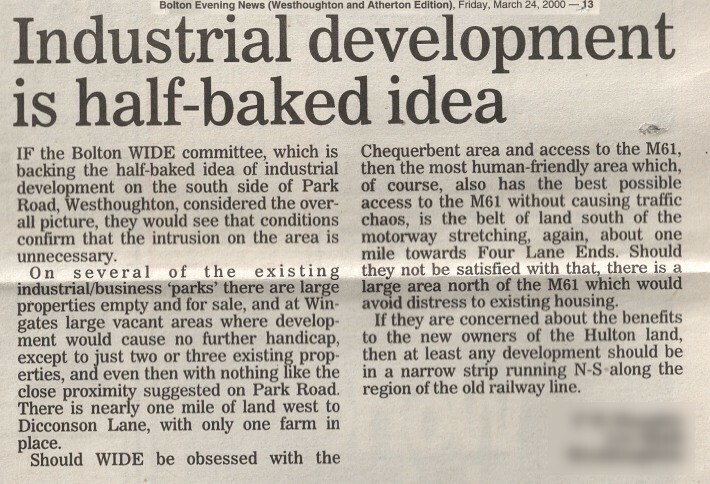 writes: Out of the blue, the front page of The then Bolton Evening News announced a 'Super Estate' of 1,100 houses that were planned to be built on a large expanse of land at the back of Park Road (Lee Hall) - there was also talk of a large Industrial Estate to take advantage of the 'easy access' to the M61 at the Chequerbent roundabout. A few people got together to discuss what they could do and decided to call a public meeting at the then Red Lion Hotel, Westhoughton. We (the organisers) found a recommended public speaker on planning issues, who spoke of the impact of additional building, traffic, etc., on the town. The meeting was packed; people were giving us money and wanting to join us. So we formed a committee and held meetings at Greenfields Social Club (now site of the Lidl). At first we were named 'Lee Hall Campaign Group,' but then news came that two other green sites were vulnerable - Bowlands Hey and Ditchers Farm; one member suggested we named ourselves 'Save Westhoughton Act Now', and 'S.W.A.N.' was born. 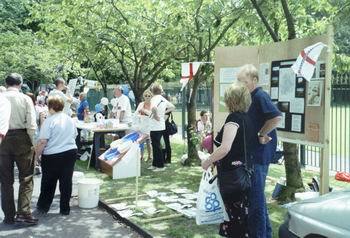 We raised money by organising concerts; having stalls selling bric-a-brac and doing tombolas. There were weekly draws too. One of our members made wooden swans, which sold for £1 and which could be seen around the town. We raised enough money to pay for experts in Planning Law to speak at the Public Enquiry for the development of Lee Hall. 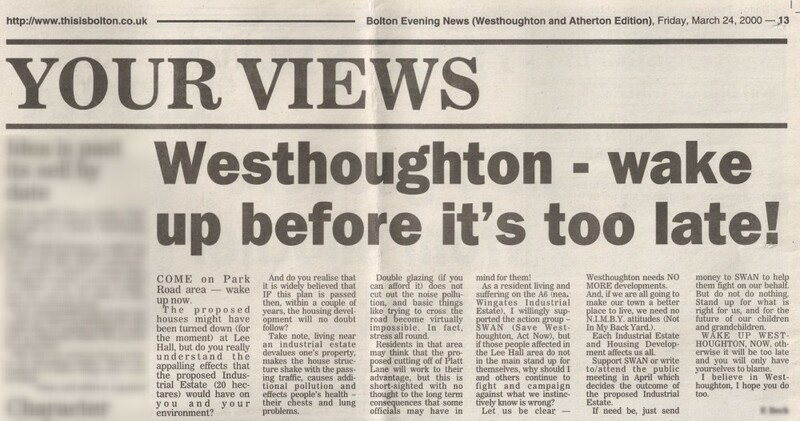 At the time Bolton and Westhoughton Councillors, and planners at Bolton were opposed to the plans. In the coming years we would be seen at community events such as the Westhoughton Carnival. As we prepared for the enquiry, the group now numbering over 1000 members - a considerable proportion of the town's population then - formed sub-committees to do research: planning, environment and any likely impact on a development of such a size. The group not only gained in support but also accumulated knowledge and insights into the planning process. Some would be able to talk in planning terminology; some would unearth a world of ecological and environmental consideration. Others would develop their skills in organising, presentation and fundraising. 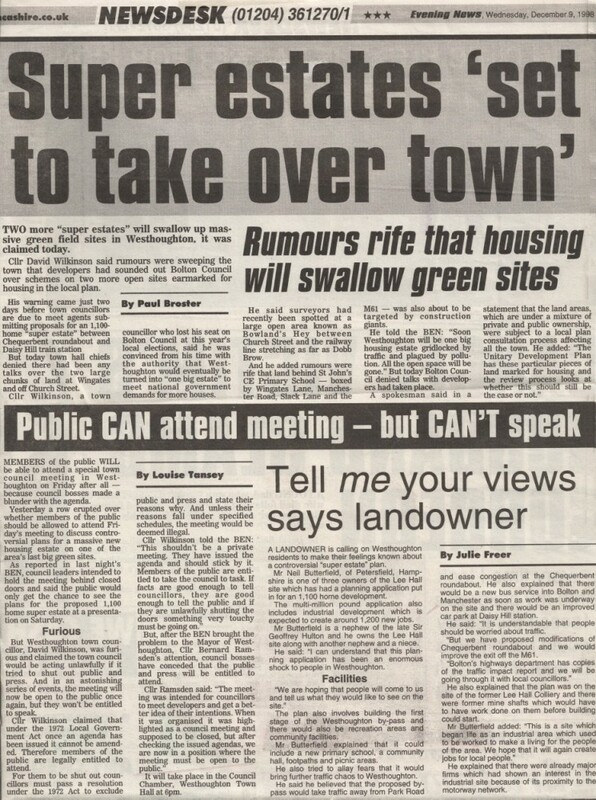 The story of Lee Hall would evolve over the months and years with the Public Enquiry taking place in 2000. In the end, working together with a common goal, we stood our ground and argued with passion but on planning grounds, the Planning Inspector agreed with us. Lee Hall was saved. And thanks to our efforts and the clear will of the people, the green, open, buffer areas of Lee Hall, Ditcher's Farm and Bowlands Hey in due course became classed as 'Protected Open Land'. Building has of course continued in and around Westhoughton as homes were provided for a growing population. The intervening years have not been without controversy, and the size of the town has doubled over a couple of decades, such that there is considerable pressure on infrastructure and amenities - acknowledged during the recent 'Local Development Framework' (LDF) planning leading to the 2014 'Local Plan'. Since that 1998 beginning, S.W.A.N., though over time reduced in active numbers, has continued to meet on a monthly and even fortnightly basis when necessary, discussing planning matters and how they might impact on Westhoughton - sometimes with the occasional guest, such as a senior planner or MP or even a representative of a fellow group - there to be heard or to listen. That watching brief, unexpectedly challenged by the developments from 2014 - a case of déjà vu as Lee Hall, and those key buffer zones around us, seem once again under attack.